Are visual images a universal language? I thought “pictures” when I was asked to teach a special topics course during my Fulbright appointment in the Czech city of Brno in fall 2018. I deliberated and decided that a visually-oriented course would likely be better for all students to engage in, no matter their native language or country. I created the course, Visual Literacy in Mass Communication, which I taught to masters-level Erasmus students from five countries: Slovenia, Belgium, Germany, Spain, and the Czech Republic. Erasmus is an exchange program among European Union countries. I arrived on campus right before classes started (due to a required Fulbright orientation program in Prague). It was then I learned that the students are normally good listeners but very shy about speaking in class or participating in discussions. I also was advised not to assign much reading. A long night was ahead, revising my syllabus to reflect this new reality. Once class started, my students confirmed that they understood spoken words better than written. So, I then adjusted to lecturing much more than usual. Luckily, having taught visual communication for years, I had lots of material to present. The big surprise: my visual references of U.S.-based companies, corporate and political issues, and popular culture products didn’t always register with the students. However, I discovered it wasn’t due so much to a cross-cultural disconnect, but rather a generational disconnect. My examples needed a lot of explanation for events even in the near past. This is the perpetual task of the teacher—updating, and globalizing, material. However, the students clearly understood the lessons on visual theories (rhetoric, semiotics, metaphor, gestalt, etc. ), and produced work that referenced their home countries or widely-known global issues. One culture jam, for example, from Czech student Klara (above) subverted a political poster featuring the Czech prime minister of the ANO (“YES”) party. On the right side of the image, Klara substituted a photo of the PM’s son, and changed the wording to read “I vote YES, because then our children will not be ashamed.” This references a recent report that the PM’s son had been lured to Crimea and abducted to stop him from testifying about alleged criminal fraud in his father’s business dealings. Another culture jam from Spanish student Silvia (above) comments on the NSA’s global reach and Google’s vast collection of personal data. What serves as “public interest” communication? This was the question the PR division of AEJMC (Association for Education in Journalism and Mass Communication) asked its members recently. Some corporate social responsibility communication (CSR) can be considered public interest communication if its primary purpose is to serve the public good. However, I found my answer in a nearby neighborhood called the “Brno Bronx.” The Museum of Romani Culture is in the middle of this Roma neighborhood. 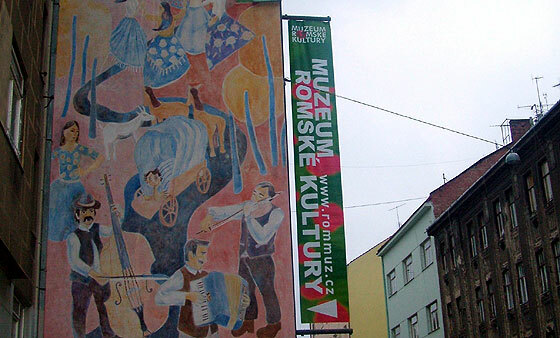 Reportedly, it’s the world’s only museum dedicated to communicating the history and culture of the Roma, from their origins in ancient India and their migration through Europe to present-day life in the Czech Republic. The Roma are also referred to as “gypsies” due to the erroneous belief they were originally from Egypt. The Roma are the largest national minority population in the Czech Republic today—about 225,000. A 2015 report found that half of the Romani people here are socially excluded, living in restricted housing in ghettos and systematically segregated in “special” schools with low academic standards. 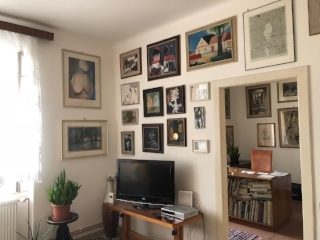 After experiencing the Romani museum several times, doing secondary research, talking with stakeholders, and doing some exploratory analysis of its website content and media reports, I believe the museum acts as a multi-dimensional, strategic, public communications device serving public interest. 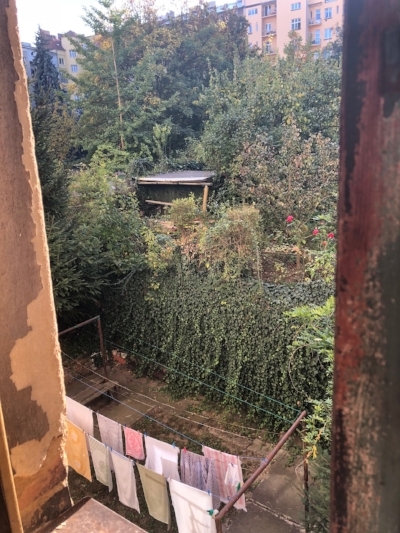 Its physical space in a former Roma ghetto provides the public with emotional experiences through still and moving images, sounds, artifacts, and storytelling. It also maintains an extensive research library and online digital platforms, an ambitious event schedule, and educational programs to help community children advance into better schools. November 11, the 100th anniversary of Armistice Day—the end of World War I—was celebrated here in Brno with reenactments. On my routine walk to the town center, I passed soldiers bivouacking in parks and citizens strolling in period costumes. November 17th, International Student Day, is also a significant day in Czechia and called the “Struggle for Freedom and Democracy Day.” It commemorates the Nazi storming of Czechoslovakian universities in 1939, the execution of 9 students and professors in Prague, and the sending of students to concentration camps. On its 50th anniversary in 1989, student demonstrations helped to spark the Velvet Revolution, ending Communist rule. 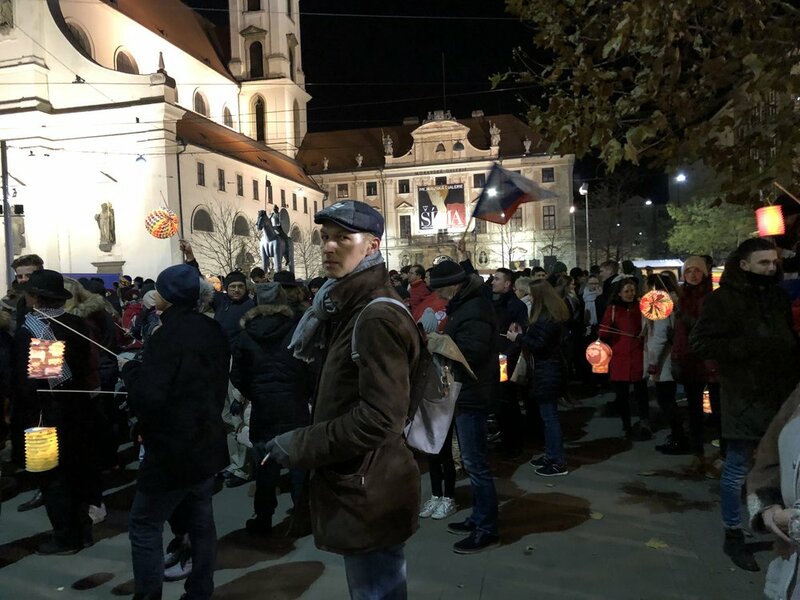 On November 17 in 2018, university students in Brno gathered in the town center to hear speeches and the playing of the national Czech and Slovak anthems. 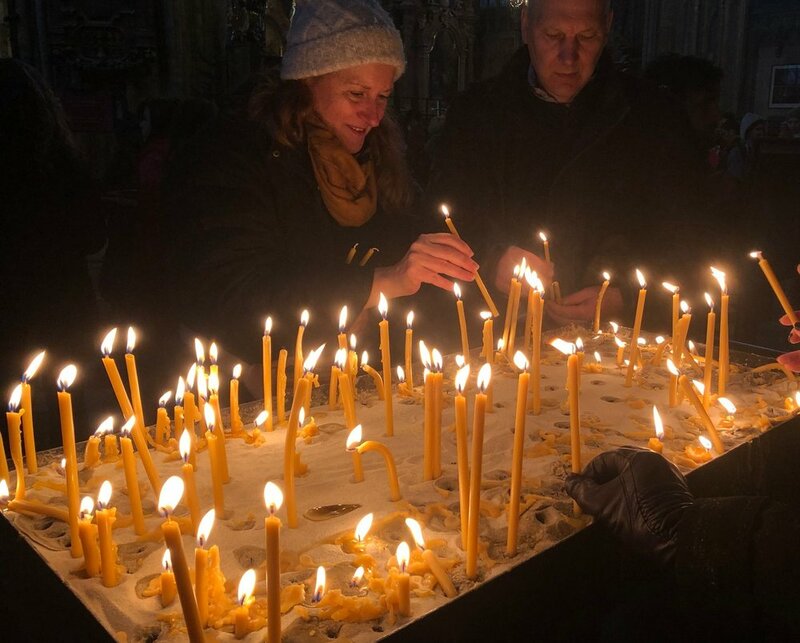 I was fortunate to join them as they held a memorial lantern-lit march to historically significant sites, lighting candles in memory of the victims of Nazism and Communism. On daily walks through Brno, I’ll also encounter an occasional “stolpersteine” (German for “stumbling stone”) in the sidewalk – plaques in front of apartment buildings that honor former Jewish residents. In 1944 Herald Deutsch was deported to a concentration camp/ghetto in the Nazi-occupied Protectorate of Bohemia and Moravia, and then transferred to a slave labor camp near Dresden where he died, perhaps from brutal work conditions or from Allied bombing. Graffiti is everywhere in this city — and most of it makes no sense to me. But I came upon this small window up in the castle and finally found some nicely familiar signs and symbols. The UN’s Agenda 2030 is making a big difference here. In my exploratory research on corporate social responsibility, I’ve learned the Czech government is requiring all firms with 500+ employees to publish a CSR report. What that really means is they also need to do more CSR engagement beyond philanthropy. I spoke about this to a master’s Econ class last week where all 45 students were international. Masaryk University is putting a lot of resources into building its international student base. It was a rare treat to hear from them about CSR awareness and activity happening in so many different countries. One of Czechia’s companies that ranks high in sustainability is the Czech-made Skoda auto (owned by VW). The 2018 national elections placed the Communist party back as power brokers in Czechia, with the re-election of a pro-Russian president and his appointment of a conservative media mogul as prime minister. Since my arrival, there have been demonstrations and marches in both Prague and in Brno calling for the removal of the prime minister over financial fraud charges. On a recent visit to Prague, I crossed the Charles Bridge and trekked through Old Town square on my way to the train station. Later I read that 30 minutes afterwards a massive anti-government march followed in my footsteps. Next time I’ll try to improve my timing to give you a closer look. But for now, I’ll leave with a photo I took from my kitchen window right before the colors turned and leaves started to fall. It could be decades ago. 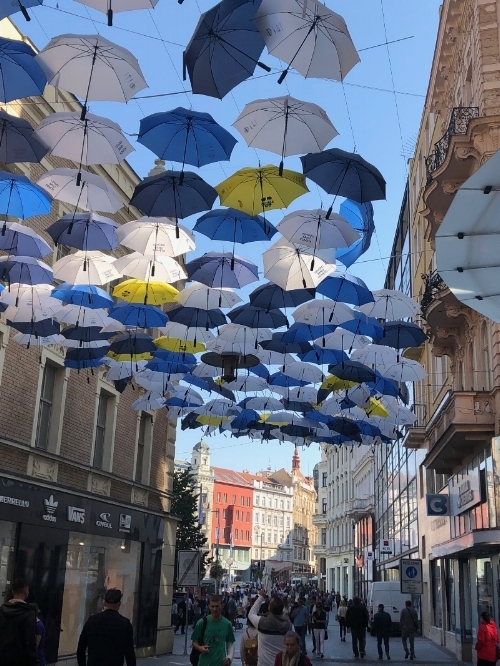 So fortunate to be living in Brno, Czech Republic (CR) throughout fall 2018 on a Fulbright distinguished chair appointment to the Faculty of Social Studies at Masaryk University. Brno is CR’s second largest city located in the wine-country region of Moravia in southeastern Czechia (CR’s official short name) — about a hour train ride from Vienna. 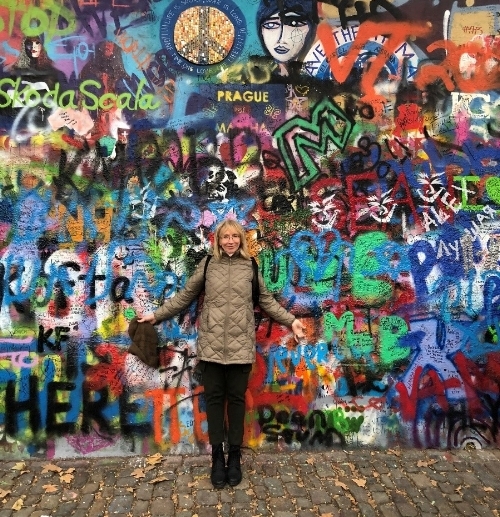 It’s old, lovely, and certainly more mellow than Prague. With five universities, on most evenings the city squares look like a college campus. I am teaching a master’s class in visual criticism one day a week to international students from Belgium, Spain, Slovakia, and Germany. My research project investigates how multinational and national corporations, along with NGOs, engage in social responsibility (SR) and sustainability initiatives here in CR. I’m joined in Brno by my husband and Mediawerks PR partner, Bill Page, who will be collaborating on the SR research. Naturally, we’ll be enjoying the foods, culture and people of this beautiful and friendly city, while also learning about the country’s tragic and valiant 20th century history and observing evidence of it still today. One of the first things I discovered about SR here is that local government does it, too. A couple years ago, Brno Town Hall (city gov’t) donated one of the large apartment buildings it owns so that local homeless families could move into the units and be guided with a vast amount of social support. It’s call the Rapid Re-Housing Brno Project. Many of the families are Roma, the largest minority in the country. In later posts, we’ll share a little about the Roma as the city has a Museum of Romani Culture.